Nurul Ali. 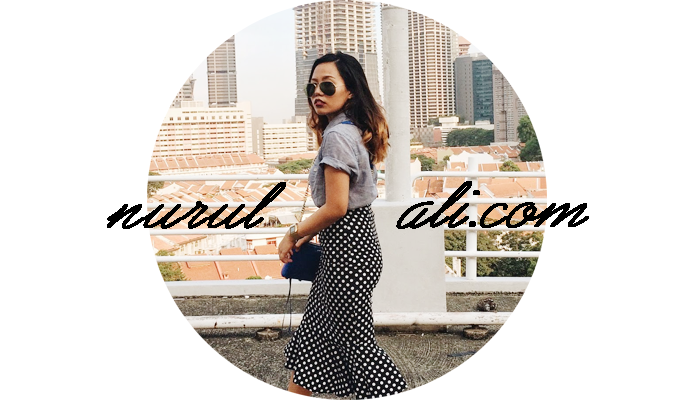 | Singapore Fashion & Lifestyle Blog: Random updates. I was on silent mode for the past weeks, eh? Blame it on my stomach flu! I suddenly lost the mood of blogging eversince the sickness. Like totally lost it. Got 2 days MC. Didn't even realise that I was actually having a fever! Kept throwing up. It's damn tiring, you know! My stomach hurts so bad after that. Sighzaaaa. I wonder if my sickness has got something to do with the Chicken Briyani from NUS Foodcourt. Everytime I think of the briyani, the urge of vomitting is there. Sick! But the colleagues and sales staff been telling me that I loss weight. Happy max. I know it's not fats that I'm losing. I don't care! On a brighter note, I have so much things to blog! Gonna do it real soon. Been busy this month. Just completed the August Men Workshop and Display installation@ Paragon last week, and next week I'll be having Pre Fall 2012 Press Open House. Brendan has decided to hand over this project to me. Thankful that he's giving me the opportunity to do this. I'm kinda nervous yet excited cause it's gonna be my first. Never had the chance to do this. Hopefully everything turns out well. I quite like the venue that the marcoms team have chosen. Didn't get to recce the venue though (was on medical leave!). But izzkay, will witness the place on the day itself. I pray that there will be no hiccups on the day itself. Just a sneak peek of the Spring Summer 2012 Installation. You can check out the display @ Paragon, level 1. It's located in the middle of Coach and Dunhill Boutique! Gorgeous Hot Pink Gown? I knowwww!